My most recent book was a copy of George B. Emerson’s A Report on the Trees and Shrubs growing naturally n the Forests of Massachusetts (Boston, 1846) which comes from the library of the Prussian explorer and polymath Alexander Von Humboldt (1769-1859). This book was sent to Humboldt by Emerson and reflects a number of Humboldt’s main interests, such as Americana. However, Humboldt did not pay a huge amount of interest to this particular book, as evidenced by the leaves remaining uncut and it still being in its original paper covers. Following his death, Humboldt’s collection was sold at Sotheby, London, in 1865. During the sale a fire destroyed much of Humboldt’s collection. Sotheby issued a new Catalogue of the Remains of the Humboldt Library in 1871which contained only 574 items out of the original 11,164. This is one of the few surviving books from Humboldt’s collection and has traces of burning on many of the pages. It appears to have been given a new binding in the late nineteenth century, although the original covers have been retained which include the inscription. This copy can be found in the sale catalogue of Humboldt’s collection, listed as ‘2663 Emerson (G. B.) 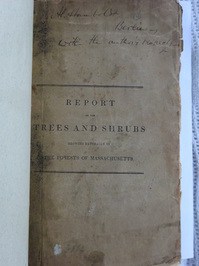 Report on the Trees and Shrubs of Massachusetts, author’s autograph inscription, royal 8vo. Boston 1846’. And your favourite book in your collection? 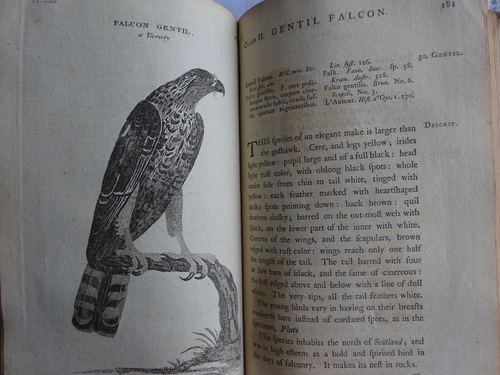 My favourite book is a relatively recent acquisition--an extensively annotated, interleaved copy of the third volume of Thomas Pennant’s British Zoology (1812). This copy is Thomas Pennant’s son, David Pennant’s personal working copy, and many of the additions and annotations reflect revisions he was making to this work in order to prepare it for a new edition--which never appeared. This copy contains numerous letters which refer to specimens; newspaper cuttings on fish and reptiles; and notes, some of which are David Pennant’s field notes from when he was observing various fish in and around his local parish of Whitford, near Holywell, North Wales. This particular book is of central importance for my research (Pennant’s is one of the main collections I study) and this work gives an impression of how David Pennant was used his library in relation to his natural history collection. 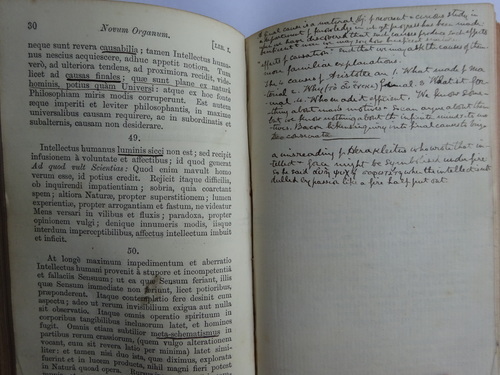 Probably my best bargain was an annotated and interleaved copy of Francis Bacon’s Novum Organum (London, 1856). I purchased this book for approximately £5. The annotator was John Grote (1813-66), Knightsbridge professor of moral Philosophy at the University of Cambridge. This was Grote’s working copy. I once saw a signed presentation copy of Richard Owen’s Description of the skeleton of an extinct gigantic sloth (1842) for a very small amount of money. I left it and once I returned to buy it, it had already been sold. Probably my annotated copy of Pennant’s British Zoology. My favourite bookstore is David’s bookshop in Cambridge. They frequently have exceptional rarities turn up in the rare books room. I would collect natural history specimens -I have a particular interest in palaeontology and already have a small fossil collection. This is nicely complimented by the early natural history and geology books in my collection. I collect natural history and natural philosophy books (a field which became known as 'science' by the late nineteenth century) which date from the late seventeenth century to the third quarter of the nineteenth century, although the majority of these date from the period between 1750 and 1820. My main interests are in natural history, in particular those books which relate to my research. A central line of my collecting relates to the provenance and the subject of a book, not necessarily its state of preservation or completeness. 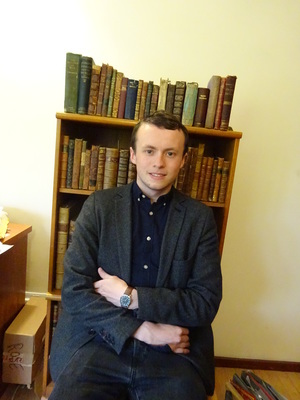 I have a particular interest in working copies of books owned by important natural historians and natural philosophers of the late eighteenth and early nineteenth centuries. Many of my books have distinct signs of being heavily used by former owners, resulting in many of them being in a fairly poor level of condition, especially as many of these are still held in their original publishers' bindings. 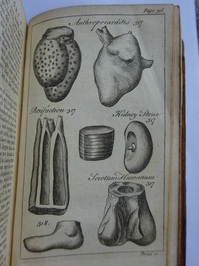 The first book I purchased was the fifth and sixth volumes from a six volume set, R. Brookes, A New and Accurate System of Natural History (London, J. Newbery, 1763). These classify both fossils and plants and reflect the relative controversies the Linnaean system of naming and classifying nature awoke in Britain during the 1760s. These books contain a number of copper plates, including one which names a fossilised bone 'Scrotum Humanum', as a joke to mock Linnaean binomial naming practices. My most recent book was a copy of George B. Emerson's A Report on the Trees and Shrubs growing naturally n the Forests of Massachusetts (Boston, 1846) which comes from the library of the Prussian explorer and polymath Alexander Von Humboldt (1769-1859). This book was sent to Humboldt by Emerson and reflects a number of Humboldt's main interests, such as Americana. However, Humboldt did not pay a huge amount of interest to this particular book, as evidenced by the leaves remaining uncut and it still being in its original paper covers. Following his death, Humboldt's collection was sold at Sotheby, London, in 1865. During the sale a fire destroyed much of Humboldt's collection. Sotheby issued a new Catalogue of the Remains of the Humboldt Library in 1871which contained only 574 items out of the original 11,164. This is one of the few surviving books from Humboldt's collection and has traces of burning on many of the pages. It appears to have been given a new binding in the late nineteenth century, although the original covers have been retained which include the inscription. This copy can be found in the sale catalogue of Humboldt's collection, listed as '2663 Emerson (G. B.) Report on the Trees and Shrubs of Massachusetts, author's autograph inscription, royal 8vo. Boston 1846'. My favourite book is a relatively recent acquisition--an extensively annotated, interleaved copy of the third volume of Thomas Pennant's British Zoology (1812). This copy is Thomas Pennant's son, David Pennant's personal working copy, and many of the additions and annotations reflect revisions he was making to this work in order to prepare it for a new edition--which never appeared. This copy contains numerous letters which refer to specimens; newspaper cuttings on fish and reptiles; and notes, some of which are David Pennant's field notes from when he was observing various fish in and around his local parish of Whitford, near Holywell, North Wales. This particular book is of central importance for my research (Pennant's is one of the main collections I study) and this work gives an impression of how David Pennant was used his library in relation to his natural history collection. Probably my best bargain was an annotated and interleaved copy of Francis Bacon's Novum Organum (London, 1856). I purchased this book for approximately £5. 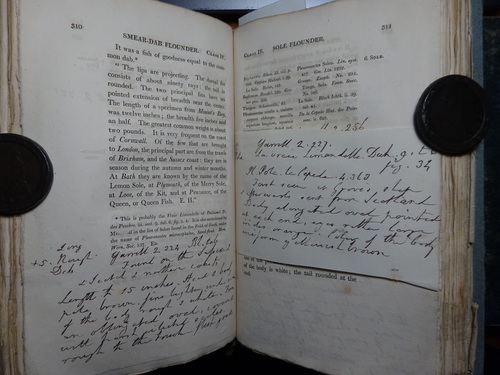 The annotator was John Grote (1813-66), Knightsbridge professor of moral Philosophy at the University of Cambridge. This was Grote's working copy. I once saw a signed presentation copy of Richard Owen's Description of the skeleton of an extinct gigantic sloth (1842) for a very small amount of money. I left it and once I returned to buy it, it had already been sold. Probably my annotated copy of Pennant's British Zoology. My favourite bookstore is David's bookshop in Cambridge. They frequently have exceptional rarities turn up in the rare books room.